In the staff restaurant at work the other day custard apples were on display with a notice urging people to try them. I’d never come across them before but my colleague who was with me said they were good so, never being one to turn down a new culinary experience, I picked one up and took it home to dissect with my camera lens, a knife and my taste buds. 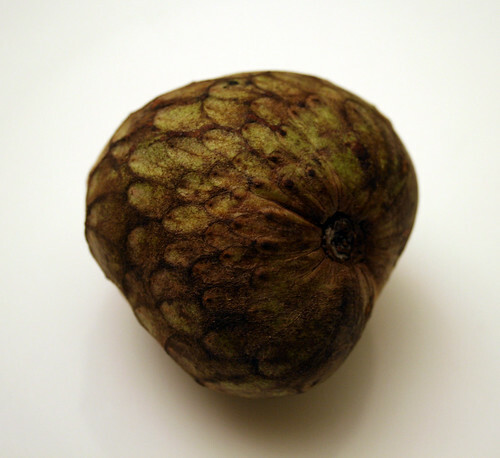 When I selected my custard apple from the ones on display in the restaurant my colleague had advised me to choose one that wasn’t too hard but gave a little when pressed so that I would know it was ripe (much like an avocado) – worth remembering if you ever buy one. I cut it open and discovered little black seeds buried inside the cream coloured flesh. When I scooped some of the flesh out with a spoon and tasted it I immediately understood why this fruit got its name. It was sweet and tasted a little like banana, with a hint of pineapple, but in both taste and texture I thought it actually did have a vague similarity to custard! 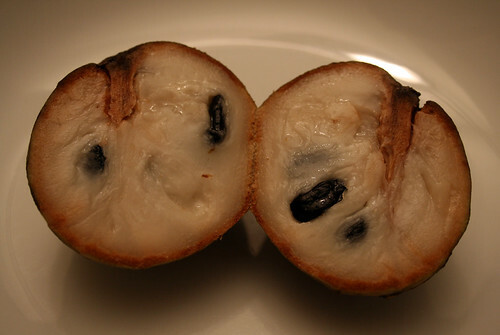 For a whole host of information about custard apples and recipes too take a look at this website from the Australian Custard Apple Growers Association. This brings back memories! 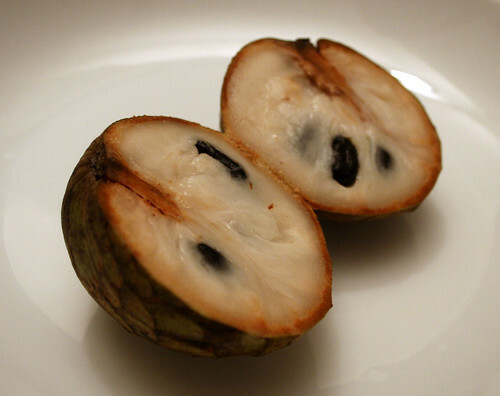 I’m from Australia and used to eat custard apples as a treat when I was a kid. Haven’t had one for a long time. I LOVE custard apples. Now I’m craving one. They’re popular in the Caribbean. I love this fruit. Back at home we used to have them when it was season and always loved eating them. I love these too. They are also popular in Asian cultures. Tasty and delightful. 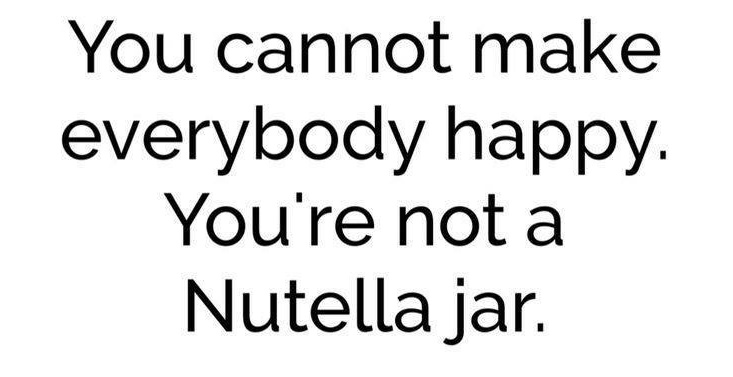 Thanks for the reminder! Custard Apples are gorgeous and the riper the better. I love them. If you like them then you should try a mangostein because the are like eating a tropical fruit salad within one fruit. I miss this so much. had so much of these back in India & I get none here. My Dad and I used to get some in the Brighton branch of Waitrose and wander down to the sea and sit on the beach and eat loads of them.